Glenfiddich produced 61 bottles of a whisky that has been maturing in a cask (casks?) for 64 years and this past week they auctioned one of those bottles off. The bottle fetched 25,200 pounds, or $37,245, from an unknown purchaser over the telephone. It’s not the most anyone has ever paid for a bottle, by a long shot, but it’s a sign that Scotch whisky is still selling strong. 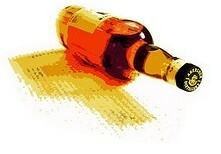 The whisky in the bottle was distilled on July 17th, 1937 and bottled on October 24, 2001. Quit a long period of time! This entry was posted in General and tagged Glenfiddich by Jim. Bookmark the permalink.